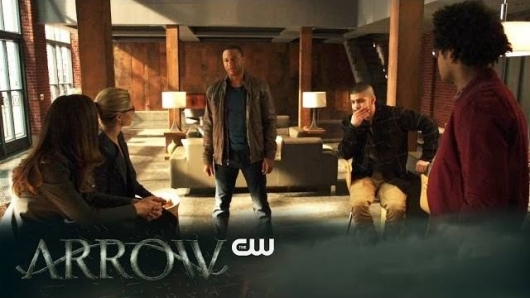 Arrow 5.18 “Disbanded” review: Oliver wants everything finished – “Chase is right.” Felicity, Diggle, and Curtis (Emily Bett Rickards, David Ramsey, Echo Kellum) disagree. Diggle gives him a talk, but he’s not having it. Diggle gathers the team – they will still work, even though Oliver will not. Chase visits the mayor and taunts him, daring Oliver to kill him. Oliver then breaks up with Susan (Carly Pope) for good. He seems regretful, but I’m not. I was not feeling their chemistry, and I’m not a diehard “Olicity” fan, but I feel like the potential for one of those super tension-filled romances should be in the cards for Oliver Queen and I have not felt that in a long time (maybe in the beginning of the Olicity stage). Felicity and her Helix pal, Alena (Kacey Rohl– The Magicians) try to reverse engineer the tech Chase used to blur his image from cams. Oliver reaches out to Anatoly (David Nykl) and the Bratva for help. No a good idea, Oliver. This is what the flashbacks were leading up to – all that brotherhood and loyalty talk. The price? Diabetes drugs. The Bratva runs into Diggle and company. Diggle is fuming, but Oliver thinks he is protecting them. He goes to talk to Felicity, but she agrees with Oliver. Curtis sneaks a peek at Felicity’s plans, and sees she has to get next to Chase to bust him. Oliver: “You stay away from me. You stay away from this. You stay away from Chase, and you allow Bratva to do its job.” Diggle is not listening and is fired up,”This is about saving Oliver.” The team obstructs Bratva’s attempts to kill Chase, but they get what they need from him anyway. Oliver punches Diggle in the face because Chase will now be in federal custody. Diggle doesn’t care – they are brothers. Felicity and Curtis get the encryption key and unmask Chase, sending the clear video everywhere. Diggle’s unwavering loyalty, and the team’s perseverance convinces Oliver to keep fighting. Unfortunately, Bratva cannot be called off. The team is all in for support. First stop? Stop the Bratva from stealing more meds. Oliver and Anatoly face off. Anatoly challenges Oliver to kill him, but Oliver shoots the alarm instead. They meet on the rooftop one last time, and it is clearly a breakup. Just as the federal agents receive the video, Chase gets the upper hand and after some vicious pen stabbing, drives away from the scene and past a slew of sirens smiling. Last week got so dark, darker than I’ve seen in a long time. I am happy that Oliver came to his senses, but the residual Chase problem and now Bratva problem will haunt Oliver for the rest of this season, and I think Bratva will last into the next one. One thing that Oliver hasn’t yet learned is that when he goes extra dark (as he does quite often), that is when he makes skewed decisions. It is only when he has support and hope that things go right for him. Arrow returns Wednesday, April 26th on The CW. OLIVER CALLS ON THE BRATVA FOR HELP — Diggle (David Ramsey) and Felicity (Emily Bett Rickards) are shocked by Oliver’s (Stephen Amell) decision to call on the Bratva to help take down Prometheus (Josh Segurra). Concerned the Bratva may overstep, Diggle has a hard conversation with Oliver about what happens if things go south. Meanwhile, Felicity learns something shocking at Helix. J.J. Makaro directed the episode written by Rebecca Bellotto (#518). Original airdate 3/29/2017.